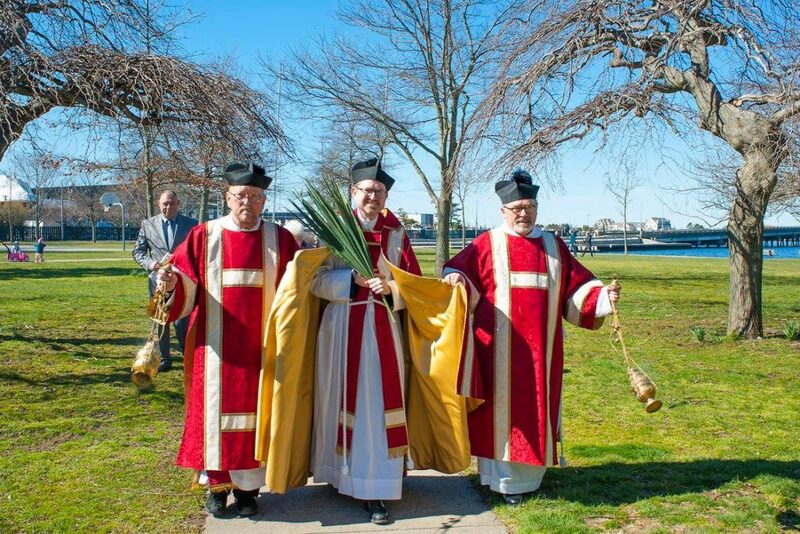 Palm Sunday, April 14: Procession & Solemn High Mass at 9:45 a.m.
All are invited to join the triumphant procession along Washington Street to the historic 1894 Zabriskie Memorial Church of St. John the Evangelist, with hymns led by a trumpeter. The service will be sung by the Professional Choristers of The Choir School of Newport County and the St. John’s adult choir. 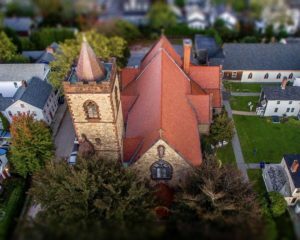 Free parking is available on the street in the neighborhood, as well as in the garage at the Newport Visitors Center, 23 America’s Cup Avenue, Newport, RI 02840, conveniently located near Storer Park and a short walk to St. John’s. In case of inclement weather, the service will begin in the church at 10:00 a.m.
Solemn Mass at 6:30 p.m. with the Adult Choir and Professional Choristers; Church open all night. Stations of the Cross at noon; solemn Liturgy at 6:30 p.m. with the Adult Choir. Featuring two excerpts from Bach’s St. Matthew Passion, and a choral setting of the Good Friday anthems incorporating a cello in the style of Bach’s unaccompanied suites for the instrument, precede the singing of Bach’s Passion Chorale. Bach’s own striking harmonization of the final stanza wrenches from the participant the question: Were you there? A violinist and cellist enhance this music. The Great Vigil of Easter at 7:30 p.m., with the Adult Choir. The Great Vigil of Easter is the single most important service of the Christian Year, and amongst the most ancient liturgies of the Church, documented as far back as the year 215 A.D., and believed to be apostolic in origins, that is, dating back to the communities founded by the twelve apostles of Jesus. All participants are invited to bring hand bells, securely wrapped, which will be rung with great joy and fanfare at the proclamation of Easter. Procession & Festival High Mass at 10 a.m., with the Adult Choir, Professional Choristers and tympani.